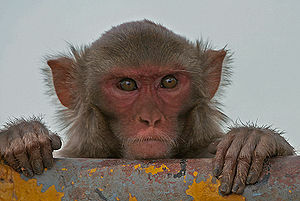 The Rhesus Macaque (Macaca mulatta), also called the Rhesus Monkey, is one of the best known species of Old World monkeys. It is listed as Least Concern in the IUCN Red List of Threatened Species in view of its wide distribution, presumed large population, and its tolerance of a broad range of habitats. Please note that the above slideshow is automatically created by searching Flickr and does not contain manually curated images. Hence, it is likely that some images may not be of Macaca mulatta. This page was last modified on 2 March 2011, at 19:41.